Deep-water soloing (DWS), also known as psicobloc, is a form of solo rock climbing that relies solely upon the presence of water at the base of a climb to protect against injury from falls from the generally high-difficulty routes. 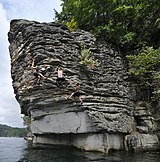 While typically practiced on sea cliffs at high tide, it can also be done on climbs above reservoirs, rivers, and even swimming pools. This type of climbing is most notably practiced on the coasts of Dorset, Devon and Majorca, but also in the Calanques near Marseille, around the Southern Pembrokeshire coast, parts of Ireland, Sardinia, Spain, Greece, the lakes of Central Texas, and many other areas. Often a dinghy is used to pick up the fallen climber, as a fall from a taller route can still knock him/her out, which could lead to drowning. Liquid chalk is often used in place of a chalk bag, as it removes the waste of loose chalk involved in a fall. Some DWS climbers apply liquid chalk in a line on their forearms so they may rechalk during the climb. Synthetic shoes are preferable to leather ones, as they will not shrink when wet. The practice of deep-water soloing in Majorca has its roots in the late 1970s. In 1978, Miquel Riera became frustrated with the aid climbing routes in his local area, so he went to Porto Pi, Palma with his friends Jaume Payeras, Eduardo Moreno and Pau Bover in order to find routes that they could free climb. This became Majorca's first bouldering venue, and as time went Riera progressed onto the short sea cliffs near there. It was named "Psicobloc", which, when translated literally into English, means "Psycho Bouldering". During the 1980s, psicobloc was overshadowed by sport climbing, which was growing greatly in popularity, but this did not stop Riera from continuing his obsession, as he put up many new routes and published articles in the Spanish climbing press. DWS became more mainstream amongst climbers when a couple of short films were made by popular climbing filmmakers BigUp Productions in 2003. The films featured some of the sport's pioneers: Tim Emmett, Klem Loskot, and a newcomer to the style, Chris Sharma. Alasha - Mallorca (ESP) - September 26, 2007. First ascent by Chris Sharma, who estimated its grade based on the effort it took to climb it without rope: "If it had bolts on it, it probably wouldn’t be a 9b (5.15b). But when you’re 60 feet up with no bolts, it takes the same amount of effort.” Sharma named the route after his daughter, Alana Sharma. Es Pontàs - Mallorca (ESP) - September 26, 2007. First ascent by Chris Sharma. Repeated by Jernej Kruder in November 2016. It features a 7-foot (2.1 m) dyno that took Sharma over 50 attempts to stick. Tyulenovo and Kamen Bryag are places for deep water soloing in Bulgaria that recently gained popularity among the local climbing society and surrounding countries in Eastern Europe. They provide enough material to keep even the real professionals interested for a week. The routes range from 5 to 20 meters and from 5a to 8a. There is also a boulder section. Gibraltar has excellent deep water soloing on Jurassic limestone. The routes are generally steep and interspersed with good traverse sections and large caves. The routes range from 3 meters to 20 meters. All the routes can be easily accessed via the cliff top. ^ "DWS World". Retrieved March 25, 2011. ^ "UKClimbing - So You Want to Go Deep Water Soloing?". Retrieved March 25, 2011. ^ "Article on psicobloc in Desnivel magazine". ^ Beail, Damon. "A History of Mallorca Deep Water Soloing". Retrieved 19 June 2012.